Crescent Moon Hunter Catarina Devon is a member of the Blackbeard Pirates. 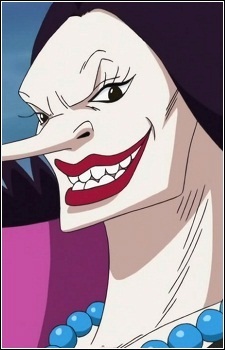 She was the most dangerous female pirate ever to be imprisoned in Impel Down within the entire age of pirates. She was originally imprisoned in Level 6 of Impel Down, along with the other legendary criminals whose history were erased there. She was initially mentioned briefly by Emporio Ivankov. She took part in the Whitebeard War alongside her new captain Blackbeard.